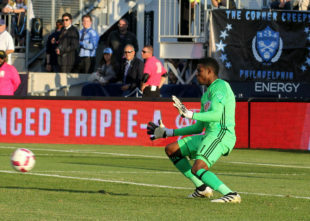 The Philadelphia Union have signed Andre Blake to a multi-year contract extension, the team announced on Wednesday. Blake, 27, was the first pick in the 2014 MLS SuperDraft. After apprenticing to a string of keepers for the first two years of his professional career, Blake seized the starting job at the end of the 2015 season and has started the bulk of the Union’s matches since. A sensational 2016 season saw Blake earn the MLS Goalkeeper of the Year award and named as the starting goalkeeper in the MLS All-Star Game against Arsenal. Blake also starred as Jamaica’s starter in the 2016 Copa America Centenario and the 2017 Gold Cup, winning the Golden Glove in the latter tournament despite suffering a hand injury in the final match. Though terms of the contract were not disclosed, the Union used Targeted Allocation Money (TAM) to complete the transaction. The Union report for the start of preseason training next week, after the MLS SuperDraft — the last major offseason event — takes place tomorrow in Philadelphia. The roster stands at 24 players. This is good news, he is a star. Pathetic this is all we get. When you can’t score goals, keeping the ball out of the net is of even more extreme importance than it always is and Blake is among the very best at that. However, true money ball teams don’t over invest in the goal keeping position. It is the one position where America produces a plethora of more than serviceable bodies than can be had at good dollar values. I am certainly glad to have Blake on this team and welcome him back, but as with all things Union you have to question the overall strategy. Given their current ability to find ANYONE let alone a ‘Moneyball’ diamond in the rough, I’m ok with $$ on Dre. Apropos of nothing, remember that any roster move in MLS is a three way process, and that includes planning the media process. Club insiders have more than likely known this was happening for a while. Happy to have Dre back….next how about someone like this: Josué Soares Pesqueira? Looks like reddit and Twitter have cracked the code: new kits are hoops. Release them already!